Bibi Rukeya (AS) (also known as Bibi Sakina (A.S)) was the youngest daughter of Imam Hussain (A.S). Sakina is a derivative of “Sakoon” meaning “Peace”. Imam Hussain (A.S) used to pray for a daughter in his night prayers, a daughter who would give him peace, and Allah (SWT) granted him his wish and blessed him with Bibi Sakina (AS). Imam Hussain (A.S) was often heard saying, “A house without Sakina (A.S) would not be worth living in” She always had a sweet and cheerful smile and a very friendly nature. Everyone loved Sakina (A.S). Other children sought her company as much as the grown ups did. She was very generous and always shared whatever she had with others. Like any other four-five year old when Sakina went to bed at night she wanted to spend some time with her father. Imam Hussain (A.S) would tell her stories of the Prophets (A.S) and of the battles fought by her grandfather Imam Ali (A.S). She would rest her head on her father’s chest and Imam Hussain (A.S) would not move from her until she fell asleep. When from the 2nd of Muharram the armies of Yazid bin Muaweyah(L.A) began to gather at Kerbala, Imam Hussain (A.S) said to his sister Lady Zainab (A.S), “The time has come for you to get Sakina used to going to sleep without my being there”. Bibi Sakina (A.S) would follow her father at night and Imam Hussain (A.S) had to gently take her to Lady Zainab (A.S) or Lady Rubaab (A.S)(Bibi Sakina’s mother). At Kerbala when from the 7th of Muharram water became scarce, Sakina (A.S) shared whatever little water she had with other children. When soon there was no water at all, the thirsty children would look at Bibi Sakina (A.S) with their eyes full of hope, and because she could not help them she would have tears in her eyes. Bibi Sakina’s (A.S) lips were parched with thirst. Several times Hazrat Abbas (AS) asked Imam Hussain (A.S) for permission to go and fight the armies of Yazeed (L). Each time Imam Hussain (A.S) would reply “Abbas, you are the captain of my army; you are my Alamdaar, (the standard bearer)”. Hazrat Abbas (A.S) would never argue with Imam Hussain (A.S). She walked up to Hazrat Abbas (A.S) and told Abbas (AS) that the children had all come to her asking for water. He could see that thirst, aggravated by the scorching heat of the desert, was squeezing their young lives out of them. Abbas (A.S) went to Imam Hussain (A.S) and requested his permission to go and get water for Sakina (A.S) and the other children. Imam Hussain then gave his permission. Abbas put Sakina’s (A.S) mashk on the Alam (Flag), mounted his horse and rode up to Imam Hussain (A.S). 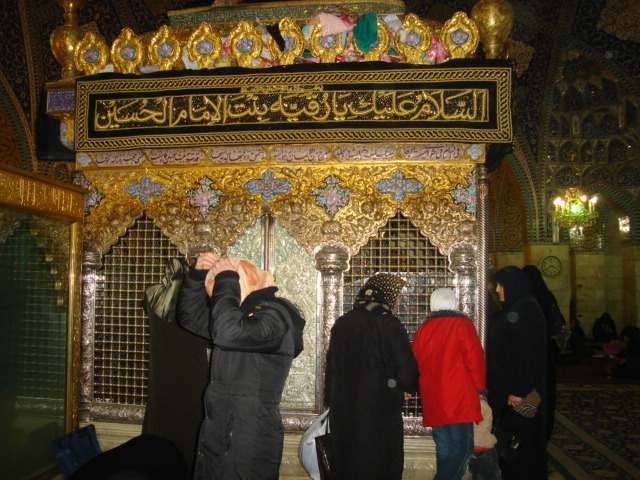 Sakina (AS) was standing next to Imam Hussain (A.S), also with her eyes fixed on the Alam of Abbas (A.S). Abbas (AS) reached the river bank fighting Yazid’s men trying to block his way, killing many with his spear. Abbas’ (AS) bravery was well known among the Arabs and the Yazidi troops started to flee in different directions. As he bent down to fill the mashk, the Alam disappeared from sight. Sakina (A.S) was frightened and looked at her father. Imam (AS) said, Sakina (A.S), your uncle Abbas is at the river bank. Sakina smiled and said, Alhamdulillah (all praise is for Allah) and called out all the children to welcome Abbas. With the water-bag filled, Abbas (AS) wanted to get the water to the anxiously waiting children as quickly as possible. Seeing him gallop towards the camp of Imam Husain (AS), a Yazidi commander shouted from the enemy ranks that if even a single drop of water reaches Hussain’s camp, it would be impossible to fight them on the battlefield. Then came the time when the earth shook and Bibi Sakina (A.S) became an orphan. The tyrannical forces of Yazid (L.A) came to the tents. They looted all the belongings of the holy Ladies (A.S). They even snatched away the hijab of the holy ladies (A.S). Bibi Fatima (A.S) daughters were left bare-headed. Shimr (L.A), the most evil of Yazid’s men, came too. Sakina was crying for her father. Instead of comforting words, Shimr (L.A) slapped Sakina’s face and pulled off earrings from her ears. Blood poured from little Sakina’s ears. Surely they would stop now. But they did not. One-by-one they set fire to the tents. The helpless ladies and children ran from one tent to another. Little Sakina’s dress was on fire, her ears were bleeding. All Sakina wanted was her dear father. The two ladies searched everywhere for the young girl but in vain. Finally, in desperation, Bibi Zainab (A.S) went to the place where the body of her brother Imam Hussain (A.S) lay and cried, “O my brother, Sakina, who you left in my care, is nowhere to be found. Where shall I look for her in this wilderness?” Just then, the moon came out from behind a cloud and Bibi Zainab (A.S) saw that little Sakina (A.S) lay on her father, sleeping on his chest like she always used to. Umar Sa’ad (L.A) asked Hur’s widow to take some food and water to the ladies and the children. 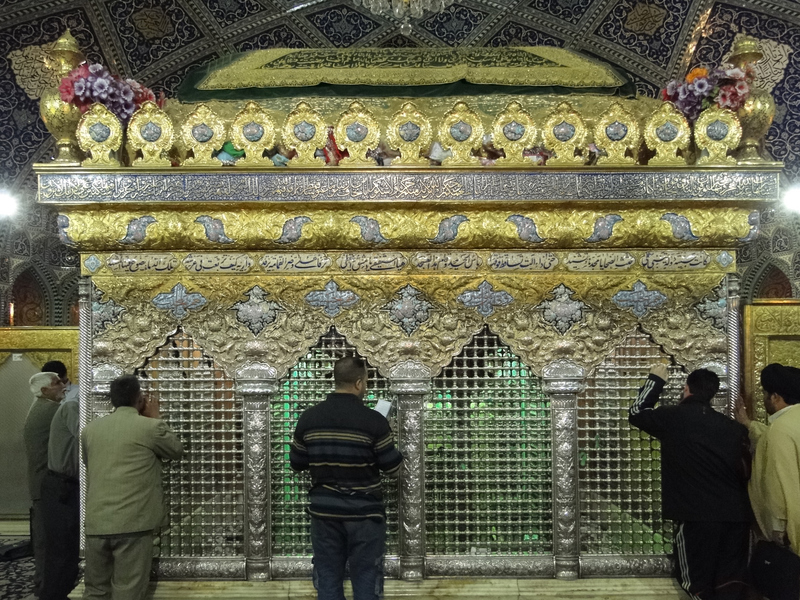 As she neared to where they were resting, Bibi Zainab recognized her. She stood up, went towards Hur’s widow and offered her condolences for the martyrdom of Hur. This gesture on the part of Bibi Zainab (A.S), who had suffered so much, lost so many, and carrying so much grief in her heart, is a lesson in real Islamic manners which the world should never be allowed to forget. Hur bin Reyahi (RA) was a general in Yazid’s army but left the Satanic camp and joined Imam Hussain (AS). Hur had realised and accepted the holy status of the Prophet’s grandson. Bibi Zainab (A.S) took the jug of water. She went to Sakina who had fallen into a fretful sleep. Gently she stroked the Sakina’s (A.S) uncombed hair. Bibi Sakina (A.S) opened her eyes. Bibi Zainab (A.S) said, “Here is some water Sakina, please drink a little. You have been thirsty for so long. On hearing the word ‘water’ Sakina cried out hopefully, has my uncle Abbas come back? When she was told that Hur’s widow had brought the water, she got up, went to Hur’s widow, thanked her and then asked Bibi Zainab (A.S), Have you all drank water? Bibi Zainab (A.S) shook her head. Bibi Sakina (A.S) asked, why then do you ask me to drink water? Bibi Zainab (A.S) said, because, my dear, you are the youngest”. Sakina (A.S) replied, no, Asghar is the youngest. Bibi Sakina (A.S) took the jug of water, ran towards where Asghar (A.S) lay buried, crying O Asghar, O Asghar. Ali Asghar was Bibi Sakina’s baby brother. The Yazidees killed the six-month-old child with an arrow when Imam Hussain (AS) requested them to give him some water as he was dying of thirst. Suddenly the camel on which the holy daughter of Imam Hussain (A.S), Bibi Sakina (A.S) and the holy sister of Imam Hussain (A.S) , Bibi Zainab (A.S) were seated, stopped near a house. Bibi Zainab’s (A.) eyes fell on Bibi Sakina (A.S) and immediately knew that she had something to say. She asked her and Bibi Sakina (A.S) answered, I am about to say something, I know my dear aunt, that at this moment it is impossible for you to fulfill it. When Bibi Zainab (A.S) insisted, Bibi Sakina replied, O my dear aunt my throat is so dry I do not think I can endure my thirst anymore. Bibi Sakina’s words were heard by the women who were on the top of the houses so that they could see the holy caravan march clearly. Among these women, a goodhearted lady immediately got up from the crowd and rushed home to bring water for Bibi Sakina (A.S). But when she came near the camel and near Bibi Zainab (A.S) she asked for a favor in return and said to Bibi Zainab (A.S) that when this thirsty child has tasted this water I want her to pray for me. On hearing this Bibi Zainab (A.S) prevented Bibi Sakina (A.S) from tasting the water and said to her, Dear Sakina, first fulfill this lady’s request. Bibi Zainab (A.S) asked the lady what Sakina (A.S) should pray for and she answered that, My first wish is that may my children never be orphans like you , please pray for me oh my dear child , I see that you are an orphan and I am aware of that God always listens to the prayer of an orphan. Bibi Sakina (A.S) raised her little hands and prayed for the lady. Then Bibi Zainab (A.S) asked her about her second wish? The lady answered, My second desire is that I wish to visit Madina, please pray for me that God will give me the opportunity to visit the holy city. On hearing the name of Madina, Bibi Zainab (A.S) asked the lady why she wanted to go to Madina. She answered, Because it is my wish to visit the Holy prophet’s (P.B.U.H&F) grave and I would also like to meet my holy lady Bibi Fatima (A.S). Bibi Zainab (A.S) replied, But don’t you know Bibi Fatima (A.S) is no longer alive? So what, the lady said, I have also served her holy daughters Bibi Zainab (A.S) and Bibi Umm-e Kulthom (A.S). I will go to Madina to have my last chance to have the honor to meet them. Now Bibi Zainab (A.S) asked her one final question. Dear Momina, if you would see your lady Zainab (A.S) would you recognize her? She immediately answered, Of course I would. Bibi Zainab (A.S) removed her hair from the face and cried, Then your prayer has been answered, behold Umm-e Habiba, it?s me Zainab (A.S), then why don’t you recognize me, don’t you recognize us all? Umm-e Habiba began to cry and said, Oh God, what crime have they committed so that they are being tortured this brutally? Bibi Zainab (A.S) continued, We are the children of the Holy prophet (P.B.U.H&F), your master Imam Hussain (A.S) has been martyred along with his devotees and left unburied on the burning sand in Karbala, their heads have been taken and raised on the lances . Look ahead Umm-e Habiba, your master’s head is in front of you, the head which lips are reciting the holy Quran. From the time when Imam Hussain (A.S) fell in the battle field, Sakina forgot to smile. Kufa saw her as a sober little girl lost in thought. Quite often she would sit up at night. When asked if she wanted anything, she would say, “I just heard a baby cry? Is it Asghar? He must be calling out for me. The spear, with Hussain’s head, got planted down! After this incidence, the wretched army changed the formation of the holy prisoners (A.S). Imam Zain-ul Abideen (A.S), was already tied with chains in his (A.S) neck and feet, The wretched army tied his (A.S) son, Imam Mohammed Baqir (A.S)- the fifth Imam, on Imam Zain-ul Abideen’s (A.S) back and then the same rope was tied on his sister, Bibi Sakina’s (A.S) neck, so that Imam Zain-ul Abideen (A.S) could not stand straight. If he did stand straight, the rope used to get tight and strangle Bibi Sakina (A.S). Even at these times of hardship and misery, Imam Hussain’s little princess always thought of the others first. She would console her mother on the death of Ali Asghar (A.S) and when she saw any other lady or child weeping Sakina would put her little arms around her. After the tragedy of Kerbala, sixteen days of suffering the miseries, the tortures and calamities for the Ahl-e-Bait – Prophet’s family (A.S), they reached Damascus. When Yazid (L.A) heard the news of the caravan reaching the outskirts of Damascus, he ordered them to stop, while he and the people of Damascus prepared for celebrations and jubilations. This caravan of holy prisoners was made to wait out side Damascus for four days. The holy family of Imam Hussain (A.S) was now facing Yazid (L.A). They were acting with patience on his actions as it was Imam Hussein’s (A.S) will that they should do so. Every lady, every child was standing in front of Yazid (L.A) tied in ropes and with no veils and Imam Zain-ul Abideen (A.S) bound in heavy chains. Suddenly Yazid’s eyes fell on the four year old girl who was standing with her one hand on her face and the other hand on her neck. Yazid (L.A) asks his men who this child is and gets the answer that this is the most beloved daughter of Imam Hussain (A.S), Sakina (A.S), and it is known that Bibi Sakina (A.S) never fell to sleep until she laid her head on her father’s chest. Is that true? Yazid (L.A) said and ordered to talk to her and when Bibi Sakina (A.S) approached Yazid (L.A), he wanted to test this love of her father Imam Hussain (A.S) in front of hundreds of courtiers. Yazid (L.A) said to Bibi Sakina (A.S), if that is true what I have just heard then try to call upon your father and we’ll see if your father’s head will come to your lap. Bibi Sakina (A.S) raised her little hands and prayed to God and then turned herself towards the head of her holy father (A.S) and said with tears flowing from her eyes, O my dear father please come to your daughter. This evil Yazid is putting our love to the test. At once the severed head of Imam Hussain (A.S) rose from the tray and came miraculously to Bibi Sakina (A.S) who started to kiss her father’s holy head and rubbed her face to her father’s face. Hearing this, the people present at court got shocked, and Yazid (L.A) sensing that people might get angry and a revolt might take place, said no to the servant’s request. Meanwhile, Hind, Yazid’s (L.A) wife, who had been a servant of Bibi Zaynab (A.S), was passing from that area. She heard the voice of Bibi Zainab (A.S), and rushed towards the court. She entered the court without her veil in a frenzied style. Yazid (L.A), who knew that his wife Hind was very devoted towards Ahl-e-Bait (A.S), quickly ordered the court be adjourned, and the Holy Ahl-e-Bait (A.S) be taken to the prison. Yazid (L.A) calmed his wife by telling her that it was a group of rebels and not Ahl-e-Bait (A.S). Yazid’s (L.A) servants, by the order of their master, placed the holy prisoners in a dark and unclean prison room. After being released, when Imam Zain-ul Abideen (A.S) reached Madina, people asked him about this jail room. Imam (A.S) said, It was a very old and unclean house, even the ceiling had fallen down. And since it had no ceiling, the holy Ahl-e-Bait (A.S) were unwrapped to the heat and cold. One night Bibi Sakina (A.S) was asleep and she suddenly woke up crying and started to look for her father everywhere. All the Holy ladies tried to console her so she would stop crying but she didn’t get any peace and continued crying, O my dear aunt , where is my father , a few minutes ago I was with my father and he kissed me and said to me that my dear Sakina you will soon be with me. But where is my father now?? When Bibi Sakina told her dream, all the holy ladies (A.S) started to cry and now this noise of crying was heard by Yazid (L.A) at his court. Yazid (L.A) sent a servant to ask why the little princess (A.S) was crying. The servant was informed that Bibi Sakina (A.S) missed her father and that is why she was crying. They informed Yazid (L.A) of the situation, and Yazid (L.A), for his sadistic pleasure, sent the severed head of Imam Hussain (A.S) to the prison and when Bibi Sakina (A.S) received the head of her father she started to cry even more and held it very tight and asked her father, who cut off my father’s head, who martyred my father, why are we held as captives? Bibi Sakina (A.S)’s body was removed from its original burial place, Dungeon of Syria, some centuries later, when a pious man of Damascus was informed in his dream that water was pouring into the grave of this young Hashmite princess (A.S). Upon confirmation that ground water was actually entering the grave, Bibi Sakina (A.S)’s body was buried in a new shrine near Yazeed’s palace, where she rests today. Her body was in the condition that if she had been buried the same day. Allah’s (SWT) choicest blessings be upon Mohammed and his holy progeny.